Setting firm boundaries with your relatives is hard. Whether you love them too much to say no or loathe how quickly they get under your skin, there’s something about family that makes it difficult to stand up for yourself. It doesn’t have to be that way. 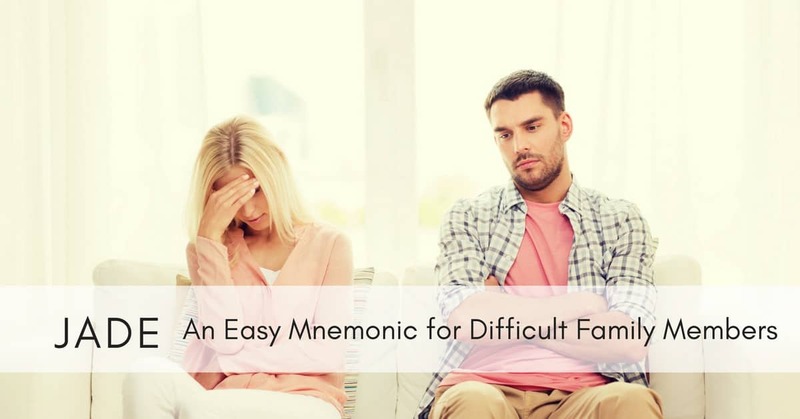 By using the JADE mnemonic, you can avoid conversational minefields and eliminate shouting matches at the dinner table. Use JADE to remember that you never have to Justify, Argue, Defend, or Explain with a relative, and you’ll be on your way to a more peaceful existence with your family. If you’re tired of getting the third degree every time you visit home, it’s time to start using the first step in the JADE method. Don’t justify anything. You don’t need to explain why you chose that college major, pierced your nose, or accepted a job your family doesn’t like. As an adult, you can make whatever choices are best for you. When your motivations are questioned, make it clear that you’re not putting up with an inquisition. A firm but polite “I wanted to do so.” or “I felt it was the best choice for me.” tells your family that you’re not open to an extended review of your decisions. When your relatives start sucking you into an argument, it can be challenging to resist. That’s understandable. Keep firm and remember that family arguments don’t lead anywhere positive. It’s okay to say, “I don’t want to argue with you.” or “Let’s agree to disagree on this.” If you want to lay on the guilt, ask your relative, “Why are you picking a fight with me?” You’ll make your point, but be prepared for pushback. A clever way for mean-spirited relatives to control a conversation is by forcing you to defend yourself and your decisions. This is a more sophisticated way of picking an argument. When you present a logical reason for your actions, you’re only giving your family new angles of attack. Don’t help out your vicious family members. Tell them “I don’t want to talk about this.” or “Let’s talk about something else.” If possible, suggest a specific and neutral topic of conversation like your relative’s children or favorite hobby. Family members can make you feel small and juvenile just by asking you for an explanation. Questions such as, “How can you think that?” or “What in the world makes you believe that?” are not going to lead to anything positive. Rather than continuing the negativity by trying to explain yourself, refuse to engage. Say something like, “Let’s change the subject.” or “We have strong opinions on this. Let’s pick a more neutral topic.” can help you avoid these conversational traps. In a functional family, you will rarely have to use any of these suggestions. If you find yourself using JADE techniques on a regular basis, then you are not the problem. Remember that family time should be about love, acceptance, and togetherness, not criticisms and nit-picking. It is always appropriate for you to deflect rude questions, change the topic of conversation, or refuse to discuss negative subjects. With JADE, you can remember four ways to de-escalate negative interactions and make family time happier.